Personalised Badges are still a very popular addition to any party. They are perhaps the original custom party wear item, whether it’s for a hen night, stag night, birthday, school or club. Or maybe just to display a promotional message in shops, restaurants, bars etc. Over the time that we have been supplying our personalised badges, we have dealt with thousands of different occasions. Each one has individually designed to suit the customers’ requirements. To help you decide on a design, we have placed several suggestions on the links above, so that you can pick one that is closest to your own idea. Feel free to have the text in different colours or different positions on the badges. And of course you can change things like the backgrounds, fonts, colours and the amount of wording on the badges. the ideas shown are purely there as ideas and also to help you to described to us the type of badge you require. We can supply any of the designs shown in 57mm and 75mm diameter badges. We also have the option to supply smaller ones at 45mm diameter. But these tend to be less popular for party wear. So please contact us if you require your personalised badges in this smaller size. Occasionally you may require something other than a circular badges. Whilst our circular badges are the most popular, we can also supply them in heart shaped and in rectangular shaped format. Several examples of typical designs for these shapes are shown on the web links above. If time permits then we are always happy to send you a mock-up of how the badge will look when we have incorporated your text and suggestions into the design. We would then normally expect to post the order within 24 hours of you giving us the approval. 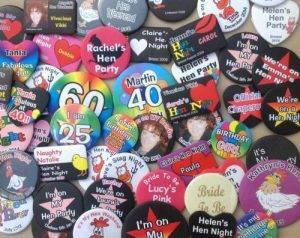 Buy personalised badges at Custom Party Wear and get quick delivery. 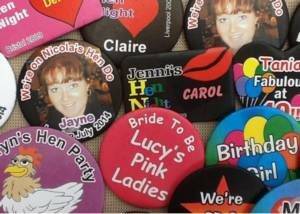 We have a small selection of badges for Birthdays and Hen NIghts that are not personalised. These are available off the shelf and there is no minimum order. Of course you can also choose one of these designs and use it as the basis for your personalised badges, where you can add whatvever names, ages, dates or information that you wish.